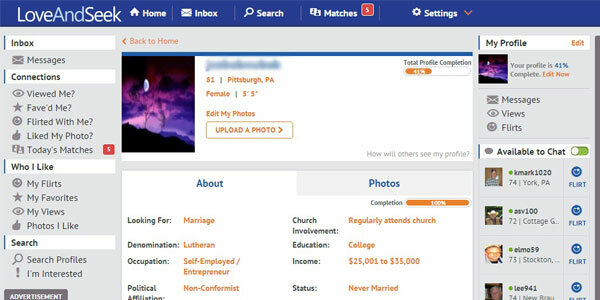 If you're a single Christian looking to mingle, then the dating site LoveAndSeek might be just what need. It's an online community of like-minded individuals who are trying to find someone who also shares their love of Christ. LoveAndSeek defines its main goal as "creating relationships" and "connecting lives." It does exactly that by allowing you to search for Christian singles in your local area. When you create an account, you will have the ability to create a photo album, list your interests, answer personality questions, and even send messages to people you find intriguing. Everyone on the site believes in the saving power of Jesus, meaning you don't have to be afraid to express yourself or your beliefs. While you can create a free account to browse profile, you must become a subscriber to actually contact others. A built-in chat feature lets you see who is online near you and allows you to instantly start a conversation. If that sounds too intimidating, you can also send them a flirt, which notifies the user that you are interested in getting to know them. Or simply save a user so you can contact them later. If you still can't think of anything to say, try one of the convenient message starter ideas listed above the message box. Upload a profile picture so that people can see what you look like. Members are permitted to upload up to 30 photos, giving you plenty of chances to showcase your great smile. Once you add your photo, your profile is then viewable by other users who can choose to like your photos, favorite you, or send you a message. Each day you are sent new matches which you can then accept, decline, or think about for later. Taking the initiative to create your new profile is really quite simple. Begin by clicking the "Search Now" button on the home page. You will then be asked a series of questions to determine what you are looking for, such as your gender, country, and zip code. The next step is to choose a username and password - remember to be creative! Finally, enter your date of birth and email address, and your account will officially be created! To finish fleshing out your profile, you can now add photos and write a short bio of yourself to gain more attention. The last step to finish activating your profile is to subscribe to one of the three different plans. If you're concerned about your safety on LoveAndSeek.com, you needn't be. All of your personal information is obscured from public view. When a visitor accesses your profile, they only see your username, city, gender, and age. Your real name, birth date, and email address are all inaccessible. No one will be able to find you in real life unless you reveal too much information about yourself in your bio section. LoveAndSeek also offers the ability to block and report users who abuse or threaten you. This easy to access option can be found on anyone's profile page or from any message you have with them. The site also offers plenty of tips and safety advice for meeting a person in real life for the first time. By following the suggestions, you are sure to stay safe in your search for love. 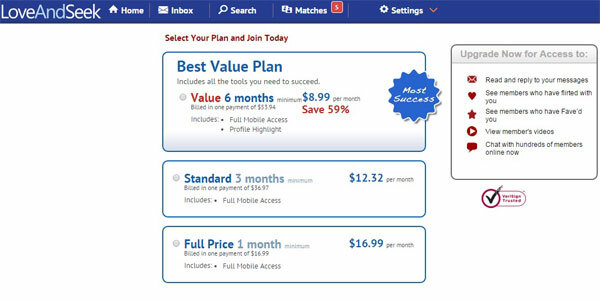 The Best Value Plan includes a six month membership and costs a total of $53.94. This equals out to $8.99 per month. The Standard Plan is for three months and costs $36.97. That amounts to $12.32 per month. The Full Price Plan is for one month only and costs $16.99. Each plan includes full mobile access, while the Best Value Plan also includes a profile highlight. Overall, this site is relatively easy to use. Once you sign in, your home page includes every feature you would want to use. A convenient sidebar menu on the left includes links to your inbox, your connections, your likes, and search tools. The sidebar on the right includes a link to your profile, as well as a chat application. Across the top menu are your matches and settings for customizing your account. When it's time to search for your next partner, simply click on one of the various search icons. You will then see a page listing many different potential matches, which can then be sorted by distance, site activity, newness to the site, or if they are currently online. Switch to gallery mode for a more visual view of potential dates. LoveAndSeek.com is a versatile and simple site without a lot of confusing or over-the-top features. It might not be super modern in its layout or offer personalized compatibility testing, but its bare bones approach is perfect for someone who doesn't need bells and whistles to find a date. 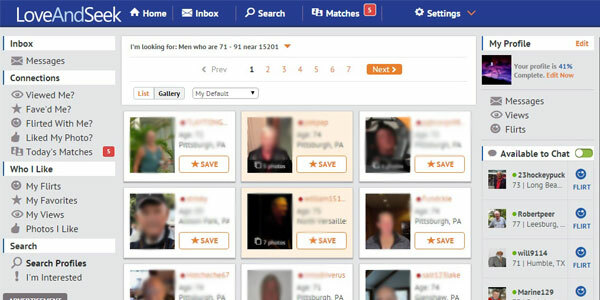 After reading this LoveAndSeek.com review, does it seem like this dating site might not be right for you? In that case, check out ChristianMingle.com, an alternative site for those with Christian values.